When our dogs age, so do their dietary needs. For quality of life that ensures he stays happy and healthy you’ll need the best senior dog food for your older companion. Read on, and we’ll help you to decide which will be the best senior dog food for your pet. As dogs age their skin gets more wrinkled and their hair becomes duller and whiter in the muzzle. They lose flexibility and muscle, along with nerve cells. Older dogs will have less effective elimination processes, lowered immune response, and decreased respiratory capacity. They may develop tumors and their tissues may become more easily dehydrated. Their skin will become less elastic. Aging dogs may experience more restless sleep, and even get fatter. Lipid and cholesterol levels may increase while hormone secretion declines. Their nails may get brittle. Check out their teeth – dental disease can increase with age. Organs, like the heart and kidneys and lungs, work with less efficiency and become more prone to infection. Dogs lose the ability to survive stress, and they’ll be less alert. Reaction and recovery processes are slower. Their senses may be less sharp than they used to be. Eyes may develop cataracts. Basically, age can mean a loss of function. But please don’t let this scare or upset you! The Best Senior Dog Food Can Help! Many dogs remain healthy for a long time and have great, happy lives. Changes happen gradually, and more often than not your dog won’t even be aware of them taking place. What matters is that there are lots of things you can do to ease this transition, and keep him in the best possible health. Poor nutrition can intensify and hasten this loss of function. The best senior dog food will help to slow it down. We know you love your dog, and you want your furry family member to have the best life possible. Part of that is choosing the best diet for your aging dog! As dogs age their physical activity levels will lessen, and their dietary requirements will alter too. 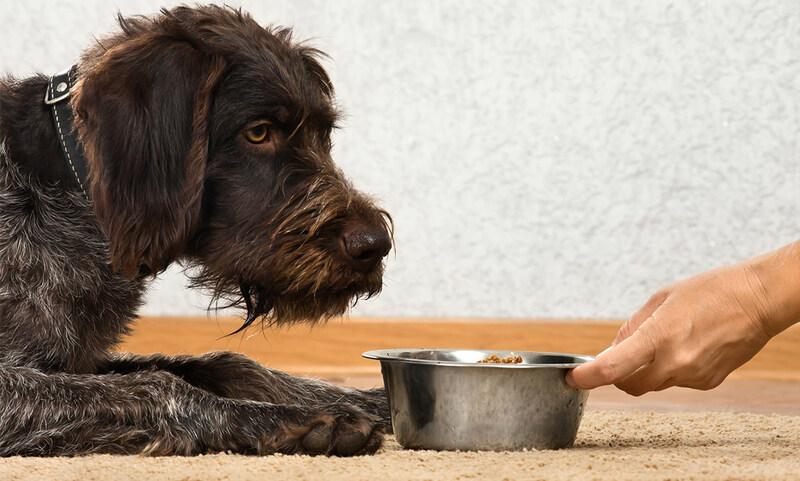 So what should you look for in a dog food for senior dogs? Protein is one thing that older dogs need, because it can help the body create amino acids for tissue repair and the metabolization of energy. But some dogs need more of it, and some need less of it as they get older. Fiber is also important, to help dogs lose weight, alleviate constipation, and regulate glucose. But, fiber can decrease the intake of some nutrients, so you should be careful here. Dogs need more sodium than people do as they get older, but most dog foods you can buy will have plenty. Dogs with heart and kidney problems, as well as hypertension, may need reduced levels of salt. Older dogs need less phosphorous than younger ones, too. Antioxidants have been shown to improve cognitive function in senior dogs. Antioxidants also help preserve dog food longer and keep it tasting fresh. Medium-chain triglycerides (like fatty acids such as omega-3) can also assist in keep dogs’ minds sharp, if supplemented long-term. Tryptophan, which helps to synthesize serotonin, can also help curb impulsive, aggressive behavior. You can find tryptophan in turkey-based dog foods. Also, you should encourage senior dogs to drink more water to head off issues of dehydration. That’s a lot to remember and look out for, and some variable scenarios too! So how do you pick the best senior dog food for your pet’s personal needs? Having a chat with your vet can help, as they will flag up any issues that might be arising. But in general take a look at how your pet is behaving and looking. See if he has gained or lost weight recently. Some dogs may need more calories, rather than fewer, as they age, as a result of a decrease in appetite, difficulty in taking hold of food, differences in metabolism, or changes in their senses. But some factors are looked for in any older dog food. These include substances like glucosamine and chondroitin. But are they actually universally useful? You will find that many dog foods for senior dogs include called glucosamine and chondroitin, to help older animals with joint pain. Vets often recommend these, because glucosamine regulates the synthesis of collagen in cartilage, and may provide anti-inflammatory relief. Chondroitin sulfate inhibits destructive enzymes in joint fluid and cartilage. Both also help create the building blocks that form cartilage. Scientists recommend a chondroitin dose of 15-30 mg. However, no evidence currently exists that shows what a therapeutic dose of glucosamine might be for canines. Additionally, there’s a lack of compelling scientific evidence that there’s a health advantage in taking either of these, despite clinical trials that have used different forms, doses, and routines. That doesn’t mean they don’t work, necessarily. Vets recommend them because they’ve seen anecdotal improvement in animals they treat. However, further research on dogs is needed to establish that these nutraceuticals are beneficial. You should know, however, that glucosamine and chondroitin do have some potential adverse effects that include hypersensitivity, minor gastrointestinal effects like flatulence, and stool softening. If your dog has joint problems, you should visit your vet and explore additional treatment options. Is your preference for dried dog food? Then the best senior dog food for your pet could still be a dry option. Look for high-quality protein sources. Real meat as a top ingredient is one signifier of a premium protein food. Also, look for fiber and nutrients that your older dog may need. You may also wish to avoid preservatives, artificial colors and flavors, allergens, and fillers that have less nutritional value. Here are some of the best dry dog food for senior dogs. What about this one! Blue Buffalo BLUE Senior Dog Chicken & Brown Rice offers a precise blend of vitamins, minerals, and antioxidants. Blue Buffalo’s senior dry dog food kibble is made from fine natural ingredients, and has no preservatives, fillers, or byproducts added. The ingredients list starts of with deboned chicken, whole grains, veggies, and fruit. Blue Buffalo formulates this product with glucosamine and chondroitin. This product is reported to give older pups great energy, and owners say they can see the difference in their coats. Maybe this one has a flavor your dog loves? NUTRO MAX Adult Dry Dog Food is a senior recipe with farm-raised chicken, whole grains for fiber, vitamins, minerals, and other nutrients. The product is responsibly made with quality ingredients and no by-products or preservatives. This recipe is designed for healthy skin and coats, a strong immune system and healthy digestion. It also provides plenty of energy for senior dogs. There’s even a money-back guarantee! Wellness Complete Health Natural Dry Senior Dog Food, Chicken & Barley, is designed to be a complete source of nutrition for senior dogs. The Wellness senior dog food formulation is all natural with premium ingredients, and a lower calorie count than regular adult dog food for slower metabolisms. It’s been created with optimal nutrient absorption for digestive health. Glucosamine and chondroitin have been added. Diamond Naturals Dry Food for Senior Dogs 8+ is another great option, with probiotics and fiber. It also includes glucosamine and chondroitin, along with superfoods, vitamin A, and selenium for their antioxidant properties. This is a high-quality food with no fillers. For older dogs, you can also buy “soft” dry food. This type of food is not crunchy, like kibble, but instead has a chewier texture. This helps dogs that may be having dental issues as they age. In a pinch, you can also moisten dry dog food with water or broth, as long as the broth has no onion in it. Dog treats are also available in soft varieties. Here are some of the best senior dog foods in dry but softer form. Purina ONE SmartBlend Vibrant Maturity 7+ Formula Dog Food is actually a combination of small pieces of dry kibble and softer, meaty bits. The Purina senior dog food formula is designed to support strong muscles and heart health. It includes real chicken, omega-6, and natural sources of glucosamine. It is easy for dogs to digest. Nature’s Variety Instinct Raw Boost Senior Grain Free Chicken Meal Formula Dry Dog Food is another good choice. It includes dehydrated raw food mixed with kibble, which makes it slightly softer than regular dry food. The formula includes unique proteins that may be more palatable for senior dogs. Wet dog food typically contains more meat protein than dry dog food, and it usually includes fewer carbohydrates. The richer aroma might tempt dogs that are losing their sensory sharpness to eat more. The moisture content can make dogs feel fuller faster. If your dog doesn’t drink enough, this is a good way of getting them extra liquid sustenance. Because of their packaging, canned dog foods may also contain fewer preservatives. Also, since the meat is closer to its natural state, wet dog food can also be more palatable for older dogs. Wet food is good for dogs with teeth and gum issues, although developing dental problems will need to be monitored. Wet food does cost more, however, and open cans require refrigeration. You can’t leave them out too long. Plus, wet food can be messy. You should decide whether wet food works for your pup, based on your senior dog’s needs. Let’s take a look at some of the best senior dog food available in cans. One good brand to try is Blue Homestyle Recipe Wet Dog Food. This wet food contains real, deboned chicken with essential amino acids, hearty whole grains for energy, and fruits and vegetables. The can contains no animal by-products, no corn, wheat, or soy, and no artificial flavors of colors. It’s a holistic mix of digestible ingredients that dogs love! Or try the CESAR Classics Poultry Flavored Adult Wet Dog Food. CESAR Senior provides fresh, sealed trays of food with slow-simmered dog food that provides complete nutrition for older dogs. The formula includes vitamin and minerals for all sizes of dogs in a paté-style presentation with meaty juices. Each tray is 3.5 ounces, which means this food is great for smaller dogs, and may provide a nice snack for larger dogs. You can also mix them with other foods for bigger pups. CESAR Senior comes in a variety of flavors. Then there’s Wellness Complete Health Natural Wet Canned Dog Food, featuring complete and balanced nutrition with tasty proteins. The company uses premium meats, wholesome grains, and fresh fruits and vegetables for protein, energy, vitamins and minerals, and antioxidants. Dogs love the Senior Formula, and the senior dog food reviews are mainly positive as well. While it is true that the ancestors of today’s dogs didn’t traditionally eat grain, most dogs don’t need a grain-free diet. But many people believe that there dogs benefit from it being removed.. Some dogs do have allergies to grain, and many owners would prefer not to give grains to their pets. If a dog has grain allergies, you should choose a grain-free diet to prevent symptoms such as itchiness, hair loss, inflamed skin, and sores. You might also like to try a grain free senior dog food if your dog suffers from food intolerances. Try Orijen Senior Dry Dog Food to help alleviate these symptoms. This grain-free food has a short ingredient list, and multiple sources of protein to keep dogs strong and lean. The Orijen senior dog food diet is meant to match the diet dogs might eat in the wild. It can help keep dogs coats shiny and give them more energy. Reviewers love this brand! For another good choice, try Holistic Select Natural Grain Free Dry Dog Food. This brand of kibble includes the right amount of protein and fat for a senior dog’s slower metabolism. It features balanced everyday nutrition, along with glucosamine and chondroitin for joint health, and is made from premium, all natural ingredients. CANIDAE Grain Free PURE Dry Dog Food is made with whole foods for gentle digestion, and boasts a limited ingredient list. In fact, this recipe includes just eight key ingredients, including sustainably-harvested salmon. Probiotics, antioxidants, and omega-6 and omega-3 fatty acids support skin health. It is gluten-free and grain-free. A wonderful dog food for older dogs! The best senior dog food all depends on your pet’s needs. The best senior dog food for you is one that keeps your elderly pal healthy and active, with good resistance to illness. You can often tell how your older dog is doing with a new food by the state of his skin and hair, and his energy levels. Also, does your dog love the food you’re feeding him? Does he gobble it up right away? All these factors play into what the best dog food is for your needs – and your pet’s. The good thing is, you have so many options of great products readily available to you. Axelsson, E. et al (2013). The genomic signature of dog domestication reveals adaptation to a starch-rich diet. Nature, 495. Bhathal, A. et al (2017). Glucosamine and chondroitin use in canines. Open Veterinary Journal, 7(1). Carlotti, D. N. et al (1990). Food allergy in dogs and cats: a review and report of 43 cases. Veterinarian Dermatology, 1. Hutchinson, D. et al (2011). Survey of opinions about nutritional requirements of senior dogs and analysis of nutrient profiles of commercially available diets for senior dogs. International Journal of Applied Research in Veterinary Medicine, 9(1). Manteca, X. et al (2011) Nutrition and behavior in senior dogs. Topics in Companion Animal Medicine, 26(1). Mosier, J. E. (1989). Effect of aging on body systems of the dog. Veterinary Clinics of North America: Small Animal Practice, 19(1).